Tender Arts Studio: Best. Thrift. Find. Ever. Seriously? A giant roll of toilet paper? C'mon, Bettsi! Really! 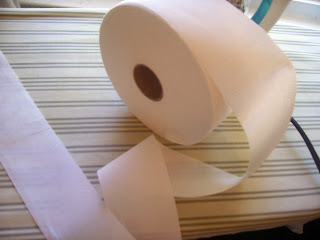 It's not toilet paper- it's muslin and it's wonderful! This was one of those "bin" items bagged in plastic that only the truly devoted will bother looking through. Yup, that would be me! Care to see what I did with it? 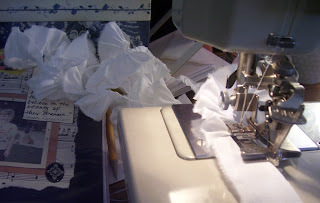 I inaugurated my vintage ruffling attachment and went to work on it. I tore a very, very long length into two more narrow strips so I could get that cool frayed edge. Ta - Da! Love it! It's tiny and ruffly and so very sweet! It's even more cute now because I've sewn a vintage glass button to the center. Inspired by this post at Ticking and Toile, I tried my hand at image transfers too- mostly so I could add a ruffle! I don't have Shellagh's knack for it, but I do love that darling ruffle! Here is a gratuitous shot of the back of the pillow- I thought my faux buttonholes were pretty clever! Anyway, whatever the original purpose of the roll of muslin, I am thrilled! And all for $1.15! 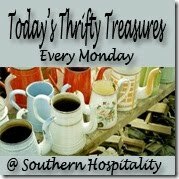 I am joining up with Rhoda at Southern Hospitality today to share this thrifting treasure. Head over there for yourself to see the other great finds! I'm also sharing on Coastal Charm- she's got another great link party going on! Okay, ONE more party for this post! I joined up with the amazing Kim at Cheap Chic Home for Fabric Fun Thursday. You gotta see what these clever ladies can do with fabric! Wow, you have been busy. The pillows look great. What a cool find, that looks like an awful lot of muslin! I'd love if you'd link this with Fabric Fun Thursday. Love your find...thanks for sharing it at NIFTY THRIFTY TUESDAYS! I love the "bins" too! What great pillows! There's just something about ruffles! Those pillows are beautiful! 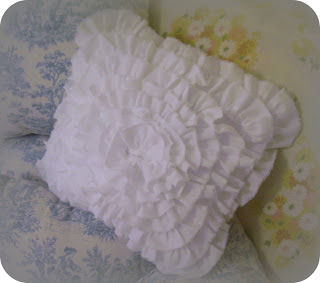 I love ruffles - I've got a ruffler attachment on my sewing wish list. I just haven't had any success with doing image transfers? Wow, Bettsi! That's amazing! Just don't let it get wet! Seriously it looks gorgeous. You are an artist. Great pillows! You are so clever and talented to create those. Love the back with the ticking and buttons.